The mezzo-soprano, Anna Todorova, was born 21 September 1892 in Sofia. In 1911 she began vocal studies in Italy with Franciscatti. From 1915 -16 she continued her vocal studies at the Geneva Conservatory with L. Keten. In 1916 she was awarded the Silver Medal from that Institution. Her stage debut was on 8 December 1910 singing Siebel in Faust. From 1911-1913 she was a soloist with the Bulgarska Operna Drushba. In 1916 after singing Carmen in Berlin she began her long career with the Sofia Opera in 1917. After her first performance at the Paris Grand Opera in 1921 as Amneris she was engaged there from 1921-1926. During this period she toured France, England, Belgium, the Netherlands and Egypt. In 1926 she was engaged by the Anvers Opera Theater in Belgium. 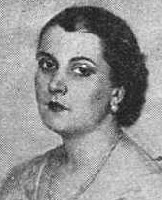 In 1932 Todorova returned to Bulgaria and performed with the Sofia Opera. Later, in addition to giving concerts, she taught at the State Music School in Sofia from 1932-1958. Among her students included Ilija Jossifov. Notably, in 1916 she sang Carmen in Bulgarian with the Berlin Opera. She was the first Bulgarian singer who sang in Bulgarian abroad. Major roles in her career included Amneris, Azucena, Dalila, Carmen, Herodiade and Marfa.